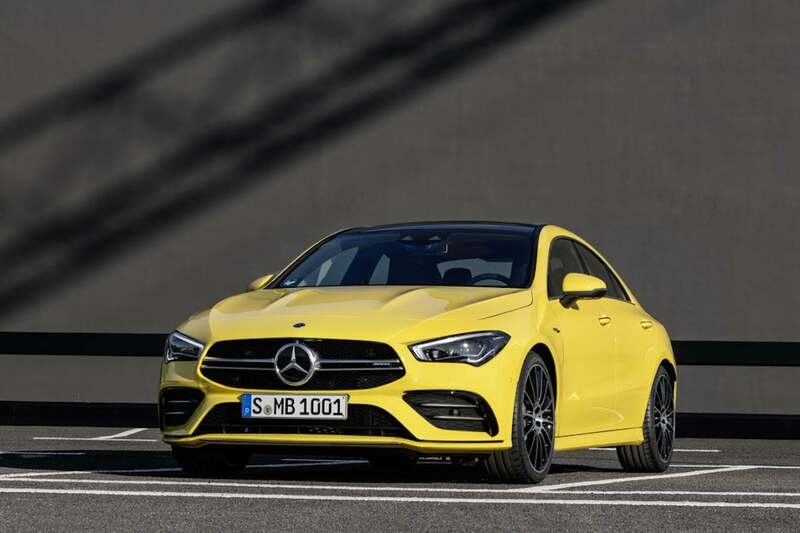 Now, the automaker is kicking things into overdrive with the launch of the 2020 Mercedes-AMG CLA 35 version that will make its debut at the New York International Auto Show on April 16. The CLA 35 will become the fastest variant ever, capable of launching from 0 to 60 in just 4.6 seconds. 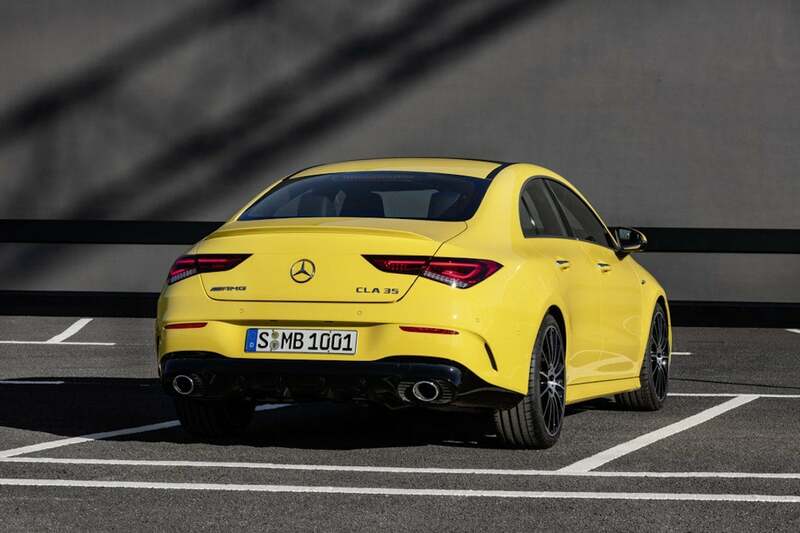 The 2020 Mercedes-AMG CLA 35 uses a twin-scroll turbocharged 2.0-liter inline-four making a peak 302 horsepower and 295 pound-feet of torque. The 2020 CLA 35 draws motivation from a twin-scroll turbocharged 2.0-liter inline-four making a peak 302 horsepower and 295 pound-feet of torque. The engine is bolted to a seven-speed dual-clutch gearbox sending power to all four wheels. Under optimum conditions, the CLA 35 sends all power to the front wheels, but under hard launches or, where traction isn’t ideal, as much as 50% of the torque will be directed to the rear. 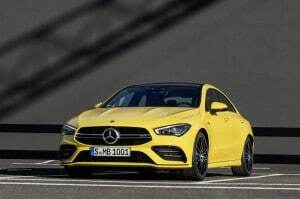 Like the standard-issue CLA, the AMG edition maintains its coupe-like profile, but there’s an emphasis on sportiness with the 35, including wider wheel arches and twin power domes on the hood. The radiator grille is unique to the AMG, as is the front bumper, with flics on the air inlet. Other unique details included silver chrome trim elements on the outer air inlets, aero-optimized 18-inch light alloy wheels, distinctive side sills, and a rear bumper with a new diffuser insert. The AMG CLA edition maintains its coupe-like profile, but there’s an emphasis on sportiness with the 35, including wider wheel arches and twin power domes on the hood. The interior retains its focus on the MBUX infotainment system which allows a motorist to perform a variety of functions using plain English commands, much like Amazon’s Alexa or the Google Home system. The CLA 35 features an ambient lighting system that can be dialed through 64 different color choices. Several fabric options, including Dinamica microfiber, are available. The flat-bottom steering wheel now features galvanized gearshift paddles for driving in manual mode. And it gives a driver a view of the broad gauge cluster which can be configured in one of three display modes: Classic, Sport and Supersport, the latter featuring a central, round rev counter and additional performance information, including G-Force and Engine Data. The MBUX system can also be operated by a 10.25-inch touchscreen atop the center stack. The new AMG CLA 35's interior is laden with the latest technology including the new MBUX interface. Within easy reach, a driver can adjust a variety of vehicle functions, such as the three-mode variable damping system. 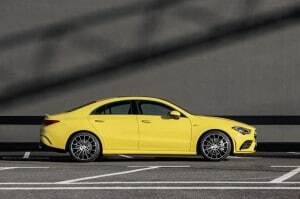 Adding to the performance package, the AMG sedan gets a high-performance braking system with 4-piston monoblock fixed calipers and 13.8-inh brake discs up front, and single-piston sliding calipers 13.0-inch discs in the rear. The discs are vented to reduce fade. The 2020 Mercedes-AMG CLA 35 will reach U.S. showrooms in “later 2019,” the automaker said, with pricing expected to be revealed shortly before that roll-out. This entry was posted on Monday, April 8th, 2019 at and is filed under Asia Pacific, Automakers, Automobiles, Business, China, Daimler, Europe, Executives, Luxury Vehicles, Markets, Mercedes, NAFTA, Personalities, Sales, Sedans, South America, Trends, U.S./North America. You can follow any responses to this entry through the RSS 2.0 feed. You can leave a response, or trackback from your own site.